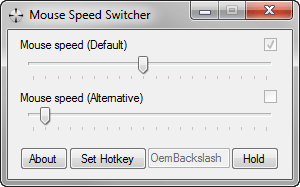 Simple program to switch between two mouse speeds, using an user-defined hotkey. Use a lower alternative mouse speed for greater accuracy in your favourite image editors or games. Use an higher alternative mouse speed for to reach all monitors quickly on your multi-monitor desktop. 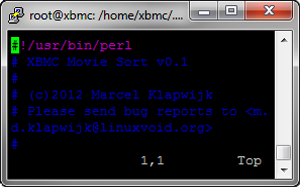 Simple Perl script to sort the XBMC movie database using the mtime of the media files. This allows for a correct "sort by date added" based on actual file dates within XBMC. Thanks to Joe Miller for creating the original addon for XBMC, which sadly stopped working in the new Eden release.